Website Monitoring Tool works to keep you informed about web site's availability and performance status in real time. Specifically designed for webmasters and websites owners, just enter your Network IP or website domain name and It’ll ring alarm tone, or alert with emails or runs specific program when your website is down or not responding due to any error including Connection Failed, Host not Found, Bad Request, Server Not Found, Low Bandwidth, Server Errors and more. This easy to use real time server monitoring tool detects network status and estimate uptime, downtime and ping status of the websites and web based applications. Website traffic monitoring software to monitor your website also detects your internet connection is active or speed is getting slow or not. It is a network traffic indicator that helps in increasing the website performance. You can monitor your home, office or any organization network. Easily monitor down and inaccessible websites performance in real time. Downtime alert notification with ringing alarm or sends specified email or runs program interruption when your website is down or not responding. 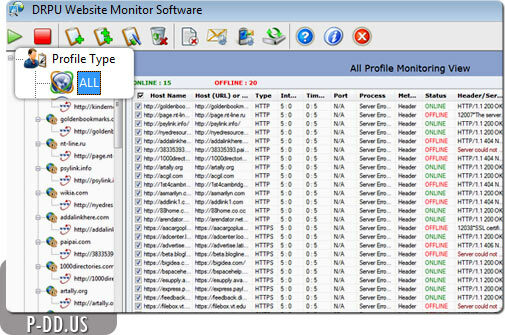 Create and monitor number of profiles at single time. Support different Internet protocols including HTTP, HTTPS, SMTP, POP3 and FTP server protocols to check the uptime, ping status and downtime websites status. Provide an alternate to costly and time consuming website monitoring services. Easy and safe to use without any technical or non-technical skills to operate it!